Preheat the oven to 375 F and grease a 2-quart casserole or a 9x13-inch baking dish with olive oil. Put 2 tablespoons of the oil in a small skillet over medium-high heat. When hot, add the millet and cook, stirring frequently, until fragrant and golden, about 3 minutes (note: don't overdo it). Spread in the bottom of the prepared baking dish. 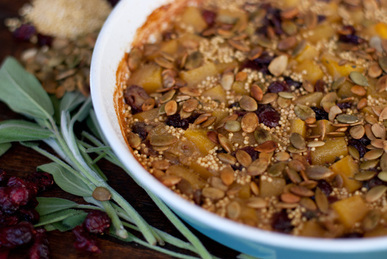 Scatter the squash or pumpkin cubes and the cranberries on top of the millet. Sprinkle with salt and pepper and the sage and drizzle with honey. Carefully pour the warmed stock over the millet mixture. Cover tightly with foil and bake without disturbing, for 45 minutes. Carefully uncover and turn the oven to 400F. If it looks too dry, add a spoonful or two of water or stock. (Note: This is key! The millet should be close to being cooked through at this point, if not you need to add liquid and keep it moist and cooking - I used another 1/4 cup+ of stock here). Sprinkle the pumpkin seeds on top, and return the dish to the oven. Bake until the mixture bubbles and the top is browned and the millet is cooked through, another 10 minutes or so. Serve piping hot or at room temperature (note: drizzle with the remaining olive oil if you like).